Friday 2 July 2004, by KURIEN*C.T. Globalization and South Asia: Multidimensional Perspectives, edited by Achin Vanaik; Manohar Publications, New Delhi, 2004; pages 362, Rs.745. IN popular perception, globalisation is a mighty wave lashing the shores of our protected land, rapidly moving in and knocking down whatever stands in its way, thus breaking down all boundaries between land and sea. The vastness of our land and the insularity that we have become used to often prevents us from looking beyond to see what has been happening even in our close neighbourhoods. But if globalisation is indeed global, it must be impacting our neighbours as well. What, for instance, has been the experience of Pakistan and Bangladesh, or Nepal and Sri Lanka, as they confront globalisation? The volume under review is an attempt to answer that question. Apart from its survey of globalisation in the South Asia countries, including India, it also deals with the impact of globalisation on areas as diverse as science and technology, environment and culture, health and education, the media and publishing. About 20 scholars, brought together at a conference by the Academy of Third World Studies at Jamia Millia Islamia and the Indian Social Institute, both well known academic centres in Delhi, have written on these themes. Apart from the lead presentations that constitute the chapters in the compilation, the book also carries accounts of the discussions that followed each presentation. The presentations themselves, and more so the record of the discussions, convey a refreshing sense of informality in dealing with complex, and at times, abstruse themes. It must have been a lively conference with considerable differences of perceptions and positions and the published version reflects the pervading vibrant mood. Three broad themes are dealt with in the volume - a selected assessment of India’s experience of globalisation; globalisation in neighbouring countries; and the implications of globalisation beyond the economic arena. In this review, I shall concentrate on the second and third themes, which are less familiar. It is on the Indian experience that there are sharp differences of positions. While Arvind Virmani with his direct involvement in governance harps on "government failure" in the economic realm and views globalisation as essentially liberalisation, privatisation and marketisation, Arun Kumar’s complaint against globalisation is that it is a one-way process where all influences are coming from outside, as it was during the colonial era. Similarly, Bibek Debroy and Jayati Ghosh have diverging positions on the impact of the World Trade Organisation on the Indian economy. If an important aspect of globalisation is the opening up of the domestic economy to external forces, the first country in South Asia to turn to it deliberately was Sri Lanka, way back in 1977, even before globalisation as an expression entered economic parlance. During that year, Sri Lanka shifted from an inward-oriented economic policy and embarked on a process of liberalisation of its trade with the rest of the world. It was the result of domestic compulsions as well as international influences. The elections of 1977 saw the rout of the socialist regime and the coming to power of the United National Party under the leadership of J.R. Jayewardene, a champion of liberalisation, who had gone to the polls promising an open-door policy. It had an appeal in a country that faced acute shortages - queues for even bread was a common sight - and where influential people had many connections with other countries on a day-to-day basis. Sri Lanka was also one of the earliest cases where the International Monetary Fund/World Bank combine tried out the structural adjustment policies - devaluation, trade and taxation reforms, inflow of foreign capital and free trade zones. The country followed a now familiar path, a sudden spurt in economic activity, new employment opportunities especially in the free trade zones and increased flow of foreign capital; but decline in food subsidies, expenditure on health and education and increase in social tensions. Liberalisation provided many new opportunities but also brought in "increased financial volatility, inequality in income distribution, decline in commodity prices, growing job and income opportunities, and threat to indigenous culture". Bangladesh also had a long history of "globalisation". From its inception in 1971, the country was heavily dependent on the rest of the world. In the 1970s and 1980s, it had to finance its budget largely with external aid and in the 1980s its development plans were financed with an aid component of 85 to 90 per cent, which came down somewhat in the 1990s. Donor demands, consequently, had a prominent role in Bangladesh’s economic policies. By about 1992-93, the country got rid of all quotas, the minimum support price scheme was scrapped, and fertiliser subsidies were removed. In terms of these changes, Bangladesh is about the most globalised country in South Asia, but its growth rate and economic performance have not been impressive. Bangladesh has received international recognition for the role that non-governmental organisations (NGOs) have been playing in its economic development, the micro-financing Grameen Bank being the most noted among them. What is perhaps not widely known is that this successful indigenous enterprise is heavily subsidised by private foreign donor agencies. The foreign financed NGOs play a crucial role in the economic and political spheres in the country, which is another distinguishing feature of Bangladesh’s globalisation policy. Nepal’s encounter with globalisation has been determined by its porous border with India, which makes it necessary to follow India’s policies in relation to opening up the economy. Nepal started opening up in the 1990s, following India’s lead. However, in terms of current account convertibility, Nepal took the lead in 1993, India following only a year later. Until the late 1990s, Nepal did not succeed in attracting much foreign investment, and when it started coming, it was mostly in the form of joint ventures and largely in consumer goods industries such as pharmaceuticals and cosmetics, which do not require sophisticated technology. What globalisation achieved for Nepal was to bring down the share of its trade with India from over 90 per cent of the total to less than 40 per cent by the end of the 1990s. Pakistan also shows special features in terms of the globalisation experience. If an economic relationship with other countries is the visible indicator of globalisation, Pakistan began experiencing it early, particularly after the Gulf countries benefited by the oil boom of the 1970s. There was a sizeable movement of workers, skilled and semi-skilled, from Pakistan to these countries resulting in a large inflow of remittances. But this was not enough to close the gap in the external account, and so Pakistan turned to borrowing, first from the international financial agencies and later from foreign private banks as well. Thus foreign capital played a major role in Pakistan’s economy through the 1980s and 1990s, resulting in Pakistan having to be much more open than India and more liberalised too. Pakistan’s export is dominated by textiles and the lucrative cotton cultivation has led to the concentration of landholdings and to the introduction of new technologies in agriculture, both resulting in perceptible inequalities. Another feature of Pakistan’s globalisation has been that there has hardly been any portfolio investment of foreign capital because, unlike India, Pakistan does not have a flourishing stock exchange. These brief sketches of the experience of South Asian countries show that even if the globalising factors are assumed to be uniform, their economic impact on different countries will be different because of the differences in the terrain. BUT is globalisation only an economic phenomenon? That is the third theme dealt with in the volume. 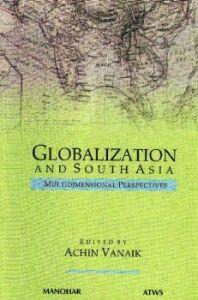 A variety of spheres of life and society are examined to establish the multidimensional aspects of globalisation. In terms of the output of scientific papers and patents, the dominance of the U.S., Europe and Japan has substantially increased during the decades of globalisation. The trio also dominates the areas of new technology, biotechnology, information technology and nanotechnology (technology dealing with extremely minute objects such as atoms and molecules). These technologies will have tremendous social consequences in the decades ahead. Privatisation of health sciences and education has been leading to deterioration and inequalities in these areas in many low-income countries. There is also a growing tendency to think of education as a training for cashable skills, taking away its challenging intellectual and theoretical functions. This is the result of the emerging selfish and consumeristic social order and an elitist bias in social discourse that totally undervalues concerns for justice, equality and fairness. An interesting piece is by a feminist writer who deals with the dominance of three global conglomerates on the publishing industry. These conglomerates, of course, publish books on a variety of social themes, but the accent on building up movements of resistance starting from concrete local issues is being replaced by the quest for markets and profits. The worth of every effort, enterprise and movement is put to the test solely in terms of its marketability. But this does not necessarily mean the homogenisation of culture, points out another scholar. Indeed, globalisation is compatible with a certain degree of cultural diversity such as the new thrust on the cult of ethnicity because it opens up new markets and opportunities for profit-making. The new dictum is: `homogenisation as far as profits are concerned, not homogenisation as far as the cultural and ethnic aspects are concerned’. Another broad area discussed in the volume, through many presentations and interventions, is the relationship between the economic and political aspects of globalisation and the role of the nation state in a globalising era. A pertinent observation is that while there is a tendency for politics, along with economics, to go global, the fundamental political structures are not moving in the direction of supranationality, but remain and are likely to remain rooted in the nation state system for a long time to come. While supranational political structures are necessary in a globalising world, the nation state has a very positive feature about it - there does not exist any other institutional structure that is accountable to the people. Strange as it may appear, nation states find support from one of the key agents of globalisation, the multinational corporation. The MNCs may not like all that the nation states do, but they would not want to see them wither away as there is an intimate connection between the corporate structure and state apparatuses. Also, just as capitalist economies show great unevenness, the distinguishing feature of the ongoing capitalist globalisation is that there are strong states and weak states. The former are among the chief promoters of globalisation. The weakening of some states cannot be seen as the result of globalisation per se, but largely as the doing of the strong states - strong because of their combined capitalist and military might - in their eagerness to lord it over others. This easy-to-read volume will be of immense help to those who desire to understand the nuances and complexities of globalisation. in Frontline, volume 21, Issue 13, Jun. 19 - Jul. 02, 2004.